« When do you sell? Two years ago I blogged about a visit to a joint in Atlanta that was famous for lutherburgers and hamdogs. Since then it has been a frequent subject of discussion with fans and I’ve also had a bit of a lifestyle change so I figured I’d write this up. First of all, happy fathers day! I hope you’ve had a wonderful one! 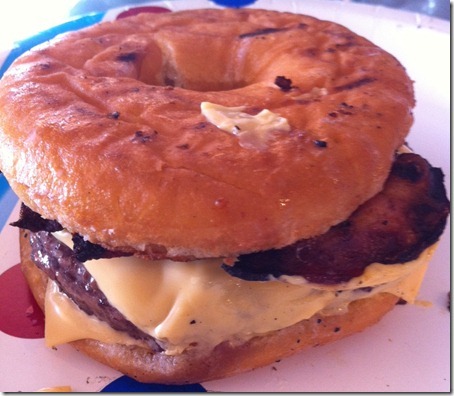 Second, if you haven’t heard about the lutherburger, it’s basically a bacon cheeseburger that uses a donut instead of a bun. It’s delicious and it’s a matter of taste – if you like cheeseburgers and you enjoy contrasting flavors (sweet and sour chicken for example) you’ll probably enjoy this. Third, this is not significantly more unhealthy (given the context) than your typical cheeseburger – it’s only roughly 50 calories more. Please see nutritional discussion below. How do you cut a donut in half when you can’t even take it out of a box without deforming it? Throw it in a freezer for about 30 minutes. It will give it the consistency of a stale hamburger bun. Take a sharp knife and slide it to the hole then work your way around. Do not stand the donut up vertically or press down with the knife (you’ll smush it) and don’t use a large knife (donuts are pretty small and it might be hard to cut across efficiently with a very big knife). After you’re done cutting the donut in half throw it back in the freezer. You have to cook the burger well. If you like your cow to moo as you eat it, this might not be for you – you don’t want juices trailing down over the donut as it makes it both messy and significantly less delicious. Your mileage may vary. Throw the frozen donut on at the same time as you put your cheese on the burger to melt. Flip once. 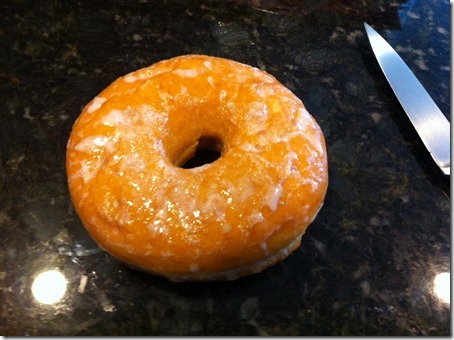 This will make the donut crunchy and give it at least some structure as you eat it. Do not overcook or cook over slow heat, it will just melt it. 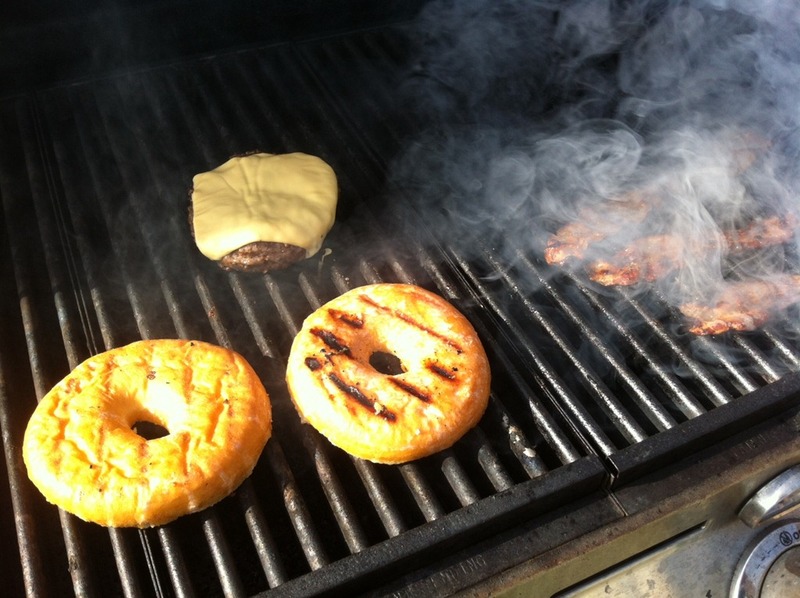 Take the donut off the grill. Put the second slice of cheese (cold one) down on top and lay the cooked burger on top. This does two things: it will melt the second slice of cheese and keep any juices from the hot burger from melting your donut bun. Layer any toppings you want. I made my bacon crunchy because you don’t want to have anything you can’t swiftly bite in half on this burger – so no grilled onions, etc. 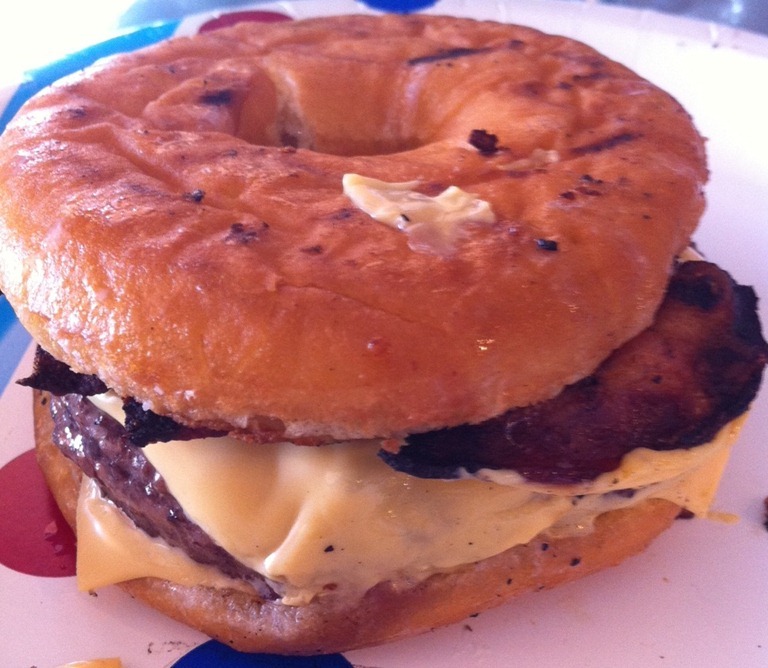 Think about it, you’re eating a cheeseburger from a donut, if you start moving it around it will just fall apart. Once you’re done with the toppings.. flip the burger on your plate. This is pretty important – your burger will be hot so you don’t want all that heat and juices melting the donut on the bottom. When you flip it the other bun will get the same heat/pressure treatment and give you a pretty unique flavor on top and on the bottom. Make sure your cell phone is fully charged. Turn off the power saving features on your phone. Disable security and add 911 to your speed dial. Try not to eat this during rush hours, give the ambulance a chance! So this is not diet food. But it’s not as bad as you’d imagine. 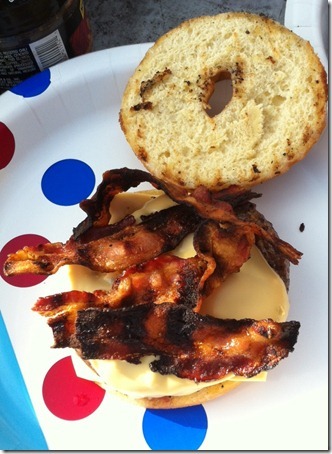 As I mentioned previously, typical hamburger buns are 120-180 calories and Krispy Kreme glazed donut is 200. Even if you used a ridiculously light weight 100 calorie bun and put on some mayo on it, you’d be breaking even. By comparison, McDonalds Big Mac is 540 calories. That’s four miles on the treadmill running at 6mph.